What is the Honey Cyclocross Utility bike? 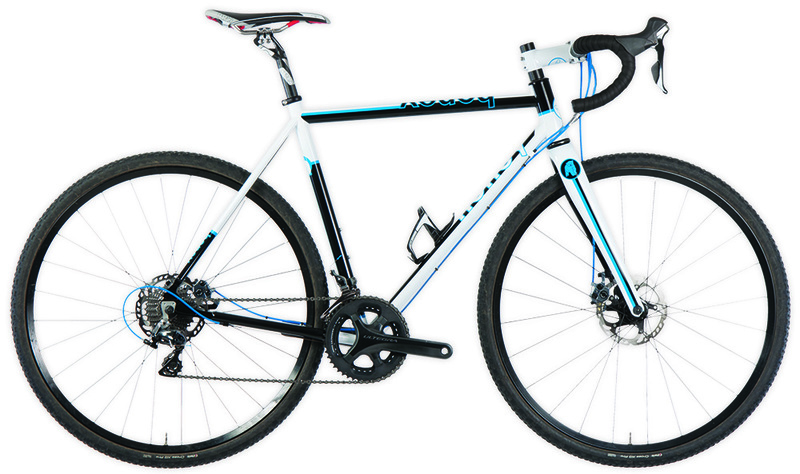 The Honey Cyclocross Utility is a race bike that has versatile abilities. This bike is ready for the cross course, and can be used on a daily basis for all kinds of riding - including multiple hour off road excursions, harsh weather commuting, or with a quick tire or wheel change, even fast road rides. Why is the Honey Cyclocross Utility bike the ideal multi-purpose bike? Stable Handling: For more stability and a lower center of gravity, the bottom bracket is slightly lower than a honey race cross bike. The front end of the Cyclocross Utility is higher for longer distance riding. There is also a longer wheel base for improved handling when using back pack or rear rack. Functional Versatility: For racing, commuting, or just riding enjoyment. Rear rack mounts integrated into the frame. We've designed the tubeset to work well with - or without - light panniers; and we provide good heel clearance for those panniers. Loves Harsh Weather: We've integrated rear fender mounts into the frame. The fork comes with fender mounts as well. Cantilever brakes if you're looking for a light weight bike. Disc brakes - low mounted work really well if you're planning on using a rear rack. And if you require more stopping power than a typical cantilever brake setup.